MY Martínez-Solana, AG Frazão Nogueira, KP Valarezo González (2017): “Communication of crisis management at the United Kingdom 2017’s attacks. Proposal for a protocol 2.0 for the communication of crisis”. Revista Latina de Comunicación Social, 72, pp. 1.566 to 1.591. The paper studies different examples of correct or mistaken crisis communication, especially in the field of politics, and its effect on the approval ratings of a political leadership. Special emphasis is placed on the sequence of the three terrorist attacks that happened this year in Great Britain, on how the prime minister Theresa May dealt with it, and how the communicative failures she made provoked the loss of the absolute majority in the 8th of June general election. Methodology: In order to elaborate this paper, 32 articles from up to 10 British media have been studied, including The Guardian, BBC and The Independent, with special attention to the events of those days. Additionally, several books and investigation papers on political communication and particular aspects of it have been consulted. Five days have specially taken as samples: the 22nd of March, the date of the terrorist attack in the Westminster Bridge; the 22nd of May, the attack in Manchester Arena; the 3rd of June, day when the London Bridge attack happened; the 8th of June, the general election; and the 14th of June, when the Grenfell tower caught fire. Conclusions and results: On the basis of the studied documents, and after finishing the investigation, the conclusion is that an incorrect management of communication during a crisis provokes a sudden drop of public confidence on the political leader in charge, and, on an occasion like this, disaffection that can be rapidly reflected on the polls. Theresa May made many political and communicative mistakes during these crisis, which resulted on her not obtaining the election outcome she hoped when she called the election. At the same time, if a crisis is well managed, the popular support of the politician raises exponentially, thanks to the round the flag effect. Crisis communication; Theresa May; ‘round the flag effect; popularity; terrorism. 1. Introduction. 2. “’Round the flag” effect. 3. Article 50 and the convocation of the election. 4. The first attack: Westminster bridge. 5. The second attack: the Ariana Grande concert in Manchester. 6. The third attack: London bridge. 7. The surprise of the elections. 8. New crisis, new failure. 9. The need of an efficient and updated communication to be successful. 10. The loss of an election because of the mistakes in communication. 11. Conclusions and results. 12. Proposal of a 2.0. protocol in crisis communication. 13. Conclusions. 14.Establishment of a crisis management team. 15. Notes. 16. Bibliography. The spontaneous is that which is tried a thousand times. We understand by spontaneous what arises automatically. In Communication management, the reaction that occurs to an emerging crisis can not be spontaneous, nor can it be the spring that articulates the response of political, institutional or business leaders. The attention to the victims and the information to the citizens cannot be left in the hands of chance or a voluntarism, however well-intentioned it may be. James Carville, Bill Clinton's advisor during the 1992 US presidential election, after which the Democrat became president, enunciated the celebrated phrase "It's the Economy, stupid!". Now days, if we adapt that affirmation to the reality of the twenty-first century, we should say "It’s Communication, stupid! ", since it is the one that labels governments as "conscious” or "unconscious”. The Communication gives legitimacy to the actions of governments of democratic countries, or else, relieves them of their sureness by way of electoral sanction. Until the middle of the first decade of the 21st century, the management of communication in situations of catastrophe, natural or not, did not leave a documentary trace that allowed to identify the responsibility of the politicians who had to manage it. But the emergence of social networks (RRSS) and massive access to the Internet have placed under the watchful eye those who have the responsibility to manage the Communication in times of risk and crisis. The guidance of a political leader is determined, fundamentally, in the capacity that one has to disrupt communicative taboos and rule out "easy guilt". The tendency to self-exculpate from the reason of the crisis unleashed, for example, before a terrorist attack, before covering all the immediate needs of the victims, and diligently informing society, usually means that we are facing leaders that "do not measure up". In the face of a crisis, the unexpected is expected. The management mechanisms must be adjusted millimetrically. Much of the crises’ success lies in becoming an official, stable and credible source. It is not worth installing oneself in a defensive silence. That is the prelude to the lack of control of the crisis management. A common mistake is to consider the tools available as an objective in itself. Therefore, sometimes, it is considered that sending emails or the use of RRSS, satisfies all the requirements of those affected. It is not like that at all. The immediacy of the channel or the frequency of messages sent electronically may not be desirable. The situation of stress that is lived after a catastrophe does not predispose individuals to be opening all the messages that, almost constantly, receives. The managers of a crisis must have designed informative channels that are accessible and that are permanently updated. In this sense, "dark sites", webs that are previously designed and made, have proved very useful. It must respond to the needs of a hearing that will only exist in case of crisis. The crisis communication model is crucial to achieve an efficient management of the consequences that, inevitably, this has on citizens. After the negative previous experiences obtained by the Spanish authorities in the management of the attacks of March 11, 2004, in Madrid, the Prime Minister of the United Kingdom, Theresa May, has repeated the same mistakes. The analysis of the sequence of the attacks that recently shook the country and the fire of the London skyscraper show that the loss of credibility before society due to an incorrect institutional communication leads to a divorce between citizens and political power. The first hours after the event occurred are key to the crisis management that, inevitably, is generated. In this first phase of the event, the authorities have the obligation to give a weighted but firm response that provides all the available information that can be communicated. Therefore, it must be avoided attribution of culpability, exoneration of possible responsibilities and giving data that are not completely confirmed or that could hinder the work of the security forces. And, in particular, the disappearance of the informative focus should be avoided. Recall that the existence of social networks has a much higher frequency than conventional media and, therefore, must be constantly updating content. In the case of the Alvia train that derailed in Santiago de Compostela, in July 2013, it is observed that hours passed between the first published tweets. On the other hand, in another tragedy, the March 2015’s accident of a Germanwings plane, caused by Andreas Lubitz, the copilot, who crashed the plane against the Alps, and which resulted in 150 fatalities, the reaction of the airline was proactive. Three hours after the tragedy, its leaders offered the first press conference. In their first intervention before the media, the airline's senior officials expressed their condolences to the families of the victims. They were empathic, and tried to become a transmission belt between researchers, relatives of those affected and citizenship in general. The research work has been carried out in order to obtain validated results on the public response to the London tragic situations such as the terrorist attacks, or the deaths that resulted of the fire that devoured a skyscraper. The loss of the electoral majority that was intended to revalidate the Prime Minister of the United Kingdom, Theresa May, suggested the connection of an incorrect management of the crisis that arose and the citizen response at the polls. Detection of the existence of indications that show that the incorrect management of communication constitutes the great problem of our time and even more accentuated with the real communicative globalization. Select the relevant contents for the field of study. Discard those contents that are not core for the observation and analysis of the study subject. .. or Documentary sources of official organisms. Establishment of a hypothesis: the incorrect management of communication by political leaders, of crises that have occurred due to attacks and/or catastrophes that are natural or not and that produce fatalities, cause the loss of social trust and a complete disaffection towards those public managers. The research has led to an exhaustive study of what happened in the United Kingdom during the study period: from March 22 to July 15, 2017. The follow-up leads to a detailed analysis of the events described by the media, both the United Kingdom and Europeans. An evaluative analysis is also made of the journalistic treatment given by the media, of the tragic events and the social repercussion that they immediately provoked in the citizens. Preparation of the results of the research work. Finally, the conclusions obtained from the investigation are provided. Proposal for a 2.0 protocol in crisis communication. When a terrorist attack or a natural disaster occurs, the most classic reaction is fear. Faced with the lack of protection, citizens seek to feel safe and, therefore, take refuge in power. If the power manages well that crisis situation, both politically and communicatively, the effect that this causes in its popularity is instantaneous and very positive, by the known as round the flag  effect. There are numerous examples of this. However, if the crisis is poorly managed, the effect is also instantaneous, although adverse, and can cause the bankruptcy of the political bonanza of a president or the loss of an election. This has also happened on many occasions. The closest example is that of Theresa May, the British Prime Minister and leader of the Conservative Party, who, on the crest of her wave of popularity, decided to call early elections, two years after the previous ones, in a particularly convulsive scenario caused by the Brexit victory in the referendum held in June 2016. May wanted the campaign to revolve around the British exit from Europe, and to achieve the best possible agreement with Brussels for it. However, the succession of three terrorist attacks in two and a half months caused the focus of these elections to change to security, and the Prime Minister had a hard time adjusting her speech to this new scenario, appearing tense and overtaken by events, and committing more and more communicative errors as the problem increased. The result of the elections, which brought a situation of a hung parliament , without an absolute majority, was an absolute failure of the conservative policy, which sought to obtain a larger number of deputies, and lost, in the attempt, the short but sufficient advantage that their party had to govern. Nobody expected the absolute conservative majority to collapse in this way and, for that reason, there followed the analysis of what had happened and why May, who seemed destined to achieve an indisputable victory that would reaffirm her as leader of the party during the next five years, was suddenly turned into a political corpse with legs, as defined by a former minister the day after the elections . They all agreed on two points. The first, from the political point of view, pointed out that the real strength and popularity that the Prime Minister had, had been undervalued, and that it was a mistake to call these elections. The second, from the communicative point of view, that Theresa May mishandled these crises in every way, not foreseeing possible answers, and showing herself visibly nervous, which had a direct impact on the image of hardness and reliability that she wanted to present to the British, as can be seen in the successive polls , and it was disastrous for his political future. 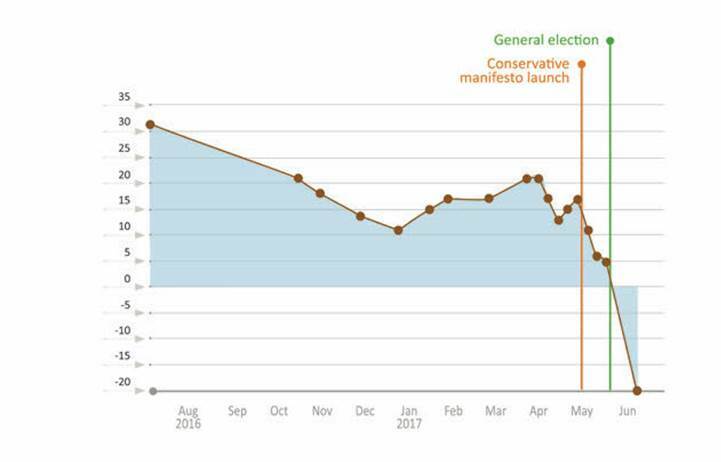 Our research aims to demonstrate that the communicative errors that Theresa May committed during the campaign, aggravated in the last week before the elections, caused an exponential growth of the Labor Party vote and were directly responsible for the tory election result. For this, a retrospective has been made from the moment in which May became prime minister until the elections of June 8, going through his evolution in his approach to Brexit, and the appearance of the terrorist threat, and other crisis situations where also analyzed in which positive or negative management had a serious impact on the political future of the leaders who faced them. The resignation of David Cameron, the morning after Great Britain voted in favor of leaving the European Union, brought some primaries and the prospect of an internal clash between the bloc that had defended the permanence in Europe, and those who had campaign in favor of Brexit. Therefore, the figure of Theresa May, Minister of the Interior and a person close to Cameron, but with a profile apparently in dialogue with the new situation, served as a meeting point between the two factions. None of the candidates representing the two main conservative factions showed up, and finally, May was named leader of the Conservative Party first and then Prime Minister  without needing to go through the polls. The first surprise of May's term was the appointment of former Mayor of London, Boris Johnson, as Foreign Minister. Johnson had been considered the political leader of the Brexit victory  and, officially, the Prime Minister defended the permanence in Europe. Soon the comparisons of the new head of government with Margaret Thatcher, "the iron lady", the first woman who exercised the presidency of the British Government, began. The staunchest Tories claimed that another Thatcher era began with a determined woman who would apply tough policies without hesitation guiding the country. Critics , on the other hand, showed their conviction that Theresa May did not have enough strength to lead Britain at such a difficult time. As the weeks passed by, it became clear that the prime minister was changing her ideas about the British exit from Europe, and that she was increasingly in favor of a hard Brexit  that would also involve abandonment of the common market. This created the first cracks in a divided government. A report leaked by The Times verbalized these contradictions within His Majesty's government, and directly accused Theresa May of not having a clear plan to launch the British exit from the European Union . The change of conservative course became evident in October 2016, when the political conference of the formation in Birmingham was held, and that represented a turning point in which the Prime Minister took the reins of the party and showed her decision to apply a ideological turn with which it embraced the most extreme ideas of the Brexit advocates, announcing restrictions of visas for students, border control measures and the obligation on the part of the companies to publish complete lists with the list of foreigners who work in them. National populism, that is, the exaltation of patriotism and nationalist policies, became the policy defended by the Government of Theresa May . On March 29, after several months of government and after having managed to silence the critical voices inside her executive, Theresa May announced, in a letter to the president of the European Council, Donald Tusk, her intention to invoke Article 50 of the Treaty of the European Union, which regulates the conditions under which a country could leave the Union  The Prime Minister kept her promise not to apply this article before 2017, and proposed a hard Brexit based on all kinds of restrictions for residency, in Britain. The only point that had not yet been clarified was that of the common market. Some members of the Government and of the Conservative Party defended that Great Britain could remain in it, nevertheless, the hardest ones defended the necessity to renegotiate all the commercial agreements of beneficial form for the British interests. The tacit agreement that seemed to be reached was that it would decide on this during the negotiation. Theresa May surprised everyone when, unexpectedly, appeared before the media in Downing Street, on April 18, and announced her decision to move forward with the elections, which would be called for June 8 . The explanation that the Prime Minister gave was that the situation had changed, and that it was necessary to renew the Parliament so that it would adjust to it. It would be these new deputies who would decide on the final agreement of the Brexit, and this detail led her to call the polls again. 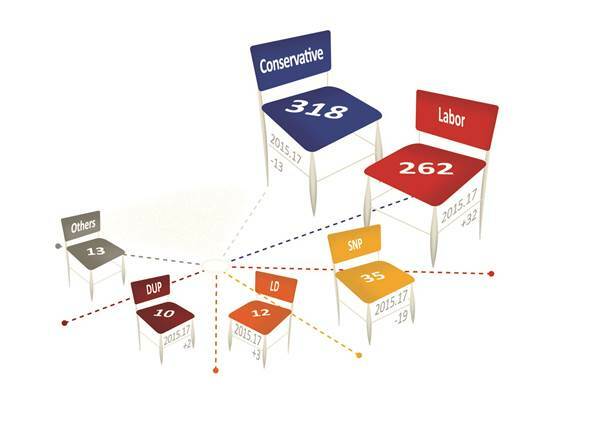 The analysts, however, pointed out that the reason was the search for a two-thirds majority for the Tories, in the new Parliament  The collapse of Labor in the polls, with a disadvantage of almost 20 points, allowed predicting that the Conservatives would increase their absolute majority. In addition, Theresa May looked for a personal mandate, to be endorsed by the polls as leader of the government. 11 of the last 23 British prime ministers came to power without elections. May wanted to leave this situation with a broad majority that also eliminated all doubts about her suitability for the position. A few weeks before May called the early elections, on March 22, at 3 o'clock in the afternoon, there was a terrorist attack in the very heart of London, which would ultimately be the first of three. A Hyundai-brand car drove more than 120 kilometers an hour on the Westminster Bridge, overwhelming all the people there . Later, it crashed into the fence of the Palace of Westminster, seat of Parliament, and there, the terrorist, who carried a knife, mortally stabbed a policeman, Keith Palmer, before being killed by the building's security agents. 6 persons, including the murderer, died, and 49 were injured with different levels of severity. Theresa May, who was quickly evacuated from Parliament, in a meeting, at the time of the attack, went that day to the scene of the attack and, the next day, during a parliamentary session, she delivered a speech in which she condemned the attack and reported the first indications of the investigation . The Prime Minister confirmed that the first indications were that the attacker had acted alone, that he had British nationality, and assured in a determined way that Britain was not afraid and would never tremble because of terrorism. That same day, the name of the murderer, Khalid Masood, originally from Kent, was known. 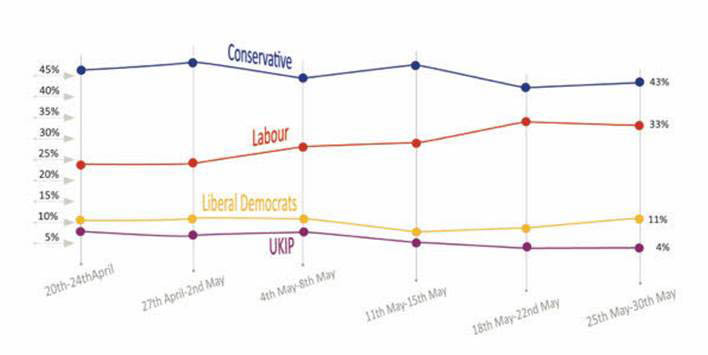 Polls after the day of the attack showed a slight rebound by the Conservatives , who had a very comfortable advantage. Theresa May had surely made the decision to call an election, and this attack could serve as a new element in the construction of the security story in Britain. However, in the days after the attack, and since the details of the investigation, which revealed that MI5 had controlled Masood, began to emerge, the first doubts began to arise about whether Theresa May had made a good security management, and on whether she would be the best prepared to lead the country in the new fight against terrorism. In the middle of the election campaign, and when the security issue seemed to be silenced, or in any case buried by other elements of importance, terrorism returned to the forefront with a brutal attack that targeted the civilian population in general. On the night of May 22, after the concert that the American singer Ariana Grande had given at the Manchester Arena, an Islamic terrorist launched a bomb, causing 23 deaths and inflicting injuries on approximately 250 persons . Barely 12 hours after the attack, Theresa May appeared before the media, in Downing Street, claiming that this attack was a sign of cowardice, and announcing that the campaign was suspended that day by the Manchester attack . Later, she went to the city, to meet the security forces and people who had worked tirelessly since the previous night. The image of the prime minister in the place of the attacks was a good campaign argument, and avoided mistakes, at least in that first moment. In fact, the polls that were published immediately after the attack on the Manchester Arena showed that the Conservatives' advantage over the Laborists increased almost 10 points . However, the publication of confidential data from media research in the United States and France, which met, almost at the same time as the British secret services, the name of the attacker and some important details that surrounded his action, caused the opposition to criticize the Prime Minister for the way she shared information with foreign secret services. This caused May to retaliate, accusing the Manchester police of having leaked the information and of having put at serious risk the security of the whole country. Outraged, the security forces of the city issued a statement in which they made it clear that they did not share information with the secret services of other countries . Terrorism had become a problem, and the Prime Minister showed signs of little political waist when it came to attacking this new situation, which was exploited by the Labor Party to try to dent her popularity. The last attack that took place in Great Britain happened on the night of June 3, at the London Bridge, and at the nearby of Borough Market. A van first ran over the passers-by on the bridge, killing three persons and, subsequently, crashed into the Borough market. The terrorists then jumped out of the vehicle, and began to stab all the persons who were there . 11 persons died, including the spaniard Ignacio Echeverría, and 48 were seriously injured. There were five days left for the elections. The initial reaction of the Prime Minister Theresa May was the correct one, making an intervention at the door of Downing Street and later presenting herself in the place of the attack . For many analysts, May finally seemed to understand the new situation, and hardened her tone, declaring that it was enough, and that it was time to apply harsh policies, which included Internet censorship to prevent the spread of Islamist ideology through the web. However, at that time, there was a change in the public perception of May’s management that ended up being definitive in the result obtained five days later. After all these attacks, the Prime Minister promised harshness with the terrorists, accusing also the Labor Party of having no courage to apply the measures that were required, and noting that it was necessary to hire more police to protect the British citizenship of the new terrorist threat. However, the response of Jeremy Corbyn was not expected, he recalled that, during his years as head of the Ministry of the Interior, there had been a cut of more than 20,000 policemen in the country, and said that the Prime Minister should resign immediately, because her credibility was in question, and that police cut could be directly responsible for what had happened . The effect that was caused was surprising, since the conservatives presented themselves with a protectionist program that identified their party with the responsibility and with the defense of their citizens, and presented the Labor Party as just the opposite, but the data of the police contradicted all this speech. From then on, Theresa May began to get nervous, because her initial strategy had failed, and she was not being able to adjust to the new situation. That's why May had to change strategy. With her intervention the day after the London Bridge attack, Corbyn had gained a lot of credibility, and many undecided or people who were going to vote for another party began to seriously consider voting for the Labor Party. Wanting to regain momentum in terms of security, the Prime Minister and conservative candidate delivered a speech two days before the election in which she said that if human rights laws got in the way of the new anti-terrorism legislation, these would be changed . May showed her most authoritarian face, in search of securing the vote of fear and stopping voter leaks to other parties. This was important, because the solid advantage that the Tories enjoyed at the beginning of the campaign was disappearing and, in fact, a poll published the day before the elections and that had been conducted entirely after the London Bridge bombing showed by the first time in two years that the Labor Party was ahead . There had been a change of roles between the two main candidates since the beginning of the campaign. Theresa May began the campaign convinced that it would gain widely, but her popularity had descended dramatically. In contrast, Jeremy Corbyn had started this career on Downing Street considered the most left leader in the recent history of the Labor Party and, therefore, virtually ineligible, however, the campaign had helped to wash his image, and a good result seemed more likely. The result of June 8 confirmed the failure of May, who sought to reach 400 deputies in the House of Commons but, at the end, fell below the 326 deputies who mark an absolute majority, losing 13 seats with respect to elections of 2015 . On the contrary, the Labor Party won a spectacular and unexpected result, reaching 40%, in what involved the biggest rise of the party since the overwhelming victory of Tony Blair, in 1997, and raising 30 seats, when the estimates three weeks before the elections predicted that they would lose more than 100. The total difference in votes between the two parties was less than one million votes in favor of the Conservatives, a distance much smaller than what the most optimistic believed possible. Theresa May managed to save her place with a controversial pact with the Democratic Unionist Party (DUP) of Northern Ireland , a far-right populist formation that defends, among other claims, that homosexuals should not have recognized rights. The agreement was negotiated in record time, due to the desire of both parties to prevent Jeremy Corbyn from articulating an alternative majority. However, despite remaining in power, the political value of the Prime Minister fell, reopening the internal battle in her party. Just a few days after the elections, Theresa May had to face a new crisis situation that was, by far, the worst one managed . At dawn on June 14, the Grenfell Tower, a building located in the exclusive Kensington neighborhood, burned completely . More than 80 persons died in a fire that took almost three days to be fully controlled, and that, according to the first data of the investigation, the reason for the fire was the exterior covering of the building, which was flammable, and that was cheaper than to place a higher quality coating. On the day of the tragedy, only one politician, the mayor of London, Sadiq Khan, approached the place of the fire. However, the next day, all politicians approached. Almost simultaneously, Theresa May and Jeremy Corbyn moved into the building. Corbyn greeted the policemen and firefighters who were still working on extinguishing the fire, and thanked them for their work, but later moved to a community center where many of the survivors of the fire and relatives of the deceased were awaiting news, and remained for a long time, hanging out with them. May, however, only met with the security forces, never encountered any victims of the fire, and quickly returned to Downing Street. This caused a huge controversy. The Guardian newspaper said that this was the prime minister's "Hurricane Katrina"  moment, and a former conservative minister, Michael Portillo, said that what Theresa May was looking for was a controlled situation in which she did not have to show humanity . The next day, and influenced by all the criticisms that were directed against her, May returned to the area and this time she did meet the neighbors. Nevertheless, the atmosphere was very tense against her, and several ministers of her government had to listen to the popular complaints before the apparent lack of heart of the prime minister . Tension increased, and a demonstration in solidarity with the victims resulted in protests against the government. Theresa May continued to be mistaken in her communication, with an interview on the BBC where she was not able to answer the journalist's questions and said exactly what she had planned to say . When, days later, the Prime Minister received victims and relatives in Downing Street, the wrong was already done. The biggest criticisms that have attacked her have affirmed that May is robotic, unable to react outside of what she has planned, and too cold. The communication team of the Conservative Party insisted in the days after the fire of the Grenfell tower that Theresa May had feelings and that the reason for her clumsy reaction was that she was very affected by this situation. However, the public was increasingly disenchanted with it, as shown by a survey conducted after the fire in which for the first time the British considered Corbyn better than May . A crisis is by nature unpredictable, although there are some exceptions. Of the many types of crisis, the most difficult are those that affect the security of the State or its own integrity, and particularly, those related to terrorism, unfortunately, each time more frequent. Panic and psychosis take over the general public, which needs to feel protected and understand what has happened. Therefore, a good political and communicative management of the crisis is never forgotten by the public, and has an effect on the surveys . The most recent and most curious example of how good management of a terrorist crisis can generate political benefits is that of François Hollande, former president of the French Republic, who had to face two terrorist attacks of varying degrees in Paris  in less than a year. Hollande, a president whose support was very low for his political errors, exercised in both crises of indisputable leader, appearing at the scene minutes after the attacks occurred in both cases, constantly updated the information as it came, and he did not speculate about the authorship of the attacks until it was safe. The effect on the polls was immediate, with a spectacular increase in the popularity of the president, rising 20 points after the attacks of November 13, 2015 . George W. Bush also did well after the attacks of September 11, 2001 in New York. The president showed up at the ruins of the World Trade Center to help clear the debris, and an emblematic photograph was taken holding the American flag in the same place where a few hours before, two planes had reduced the Twin Towers to pieces. Its popularity rose to 90% after the attacks , and thereafter, assumed a very different profile that is summarized in the subsequent invasions of Afghanistan and Iraq. All these crises, and many others, forged the political leaders who confronted them, and were characterized by a common element: the importance of efficient, honest and up-to-date communication. Each circumstance was particular, but in all cases, the leaders who faced these crises controlled the information, and it was they who transmitted it. The two cases of well-managed terrorist crises also have the shared component that both Bush and Hollande moved to the scene to be with the victims, which always has a very important social effect. Whether they knew the importance and effect that a good crisis communication has on the assessment of a politician or not, these examples show that in a crisis there is no need to neglect any element. One of the worst crises provoked by terrorist attack in history occurred in Spain after the terrorist attacks of March 11, 2004 . The Government of José María Aznar affirmed from the beginning that the terrorist group ETA was behind the attack, something credible, since this group had been active since the final years of the Franco regime and it was very deadly. However, the first police investigations began to point in another direction, that of jihadist terrorism, which had previously hit the West. The members of the Aznar executive knew live the advances that affirmed with less and less doubt that Al-Qaeda was the author of the attack, but this was not communicated to the public, who knew, from other sources, that their Government had not told them the truth . Three days after the attack, the general elections brought a surprise victory of the PSOE, which was a direct consequence of the terrible and dishonest communication management of the PP between March 11 and 14, 2004. Another crisis that was mismanaged at all levels was that which arose after the death of Diana of Wales, in a car accident in Paris at the end of August 1997. Although she had been divorced from the Prince of Wales, in 1995, Diana was a woman very much loved by the general public and her death was a tragedy for everyone. The official reactions were very different. On the one hand, Prime Minister Tony Blair reacted very quickly, making an emotional speech in which he defined the deceased as "the princess of the people”. Queen Isabel II and the royal family, on the other hand, did not change their agenda because of the tragedy. The collapse of the, until then, armored general valuation of the monarch, caused that Isabel II had to return to London to recover popularity . From these two crises, it is clear that when a political and communicative error is made, even the most popular leaders can fail. The reasons why a crisis cannot be managed correctly can be very varied: political tactics, in the case of 11-M, where the imminent perspective of the elections prevailed in the communication strategy; slow reaction, such as the days when the royal family was slow to react to the case of Lady Di's death; denial of the problem or concession of less importance to the crisis than it really has. In all cases, the result is disastrous, and causes a very large popular disaffection that usually turns against power, as seen in these examples. The political and communicative errors of Theresa May were the culprits of the bad result that the Conservative Party obtained in the elections of June 8. Nowadays, it seems impossible for a politician to firmly believe that a campaign will go as he wants; nevertheless, May acted during great part of the short campaign before the elections as if it really thought it. The prime minister demonstrated in the first days that she had prepared her arguments about the Brexit, however, as soon as the attacks began, she became a cold leader with no capacity to react, unlike her rivals, especially Jeremy Corbyn. When May was elected as leader of the Conservative Party and Prime Minister, a year ago, the tories celebrated having closed with relative simplicity the problem of David Cameron's succession. Today, those same politicians who raised the Minister of the Interior at the head of Her Majesty's Government, seriously question her suitability and question how much longer she should last in power. At this moment, it seems evident that Theresa May will not finish her term, and some analysts point out that, as soon as the agreement for Brexit is closed, the Prime Minister will give way to another person within her party. Politically, Theresa May has failed. Its agreement with the DUP to give stability to the government in the minority has a great political risk, since, for the first time, the London executive takes sides with a part of Northern Ireland, an area that, until a few years ago, was deeply convulsed. Her credibility to take strong political measures to fight against terrorism is in question, given the policies that the Prime Minister applied during her time in the Ministry of the Interior. It would be necessary another document to analyze how a Prime Minister with one of the greatest support in history in her own party and with a burning opposition was able to squander an absolute majority and leave the country in great uncertainty. Communicatively, the management that Theresa May made, first, of the attacks and, afterwards, of the Grenfell tower's burning, was insufficient. In the words of Luis Arroyo, "a national crisis is usually an occasion for leaders to exhibit their abilities as heroes. In fact, with very little to do, people greatly appreciate it”. This has not been the spirit that has governed the action of the prime minister during the difficult weeks of the campaign, and the result is known to all. May's case is also unprecedented in the history of Great Britain, where its leaders, both monarchs and politicians, have represented strength and confidence in times of difficulty. During the Second World War, when German aircraft bombed Britain for more than 8 months in what became known as Blitz, King George VI and his wife, Queen Elizabeth, remained in Buckingham Palace, located in the center of London, although Windsor Castle, outside the city, could better protect them. After the armistice, the British people recognized the role of the monarch as the first who always wanted to breathe hope into a people at war . Also during the war, Winston Churchill did not leave London, and kept his cabinet going. At this stage, both the king and the prime minister were subject to the same regime of power outages and product rationing as the rest of the population. Each crisis is particular, however, there is a series of actions that must always take place, and the first is that the political office is present. The public always judges with greater benevolence the leaders who see more humans. When, in 2010, the former president of Argentina Néstor Kirchner died after suffering a heart attack, his wife, Cristina Fernández de Kirchner, enjoyed a significant increase in popularity after the president's funeral, during which he appeared vulnerable and human. Theresa May, on the other hand, always reacted awkwardly and in a contradictory way. There are leaders with a greater empathy, who naturally come closer to the people during this type of circumstance. For those who are not, advisors should help. The popularity of the Prime Minister has been reduced as the crises happened. In the Westminster attack, there were two companions in the ranks of the prime minister who won popular solidarity. On the one hand, Tobias Elwood, who tried to revive police Keith Palmer just a few seconds after the attack. On the other, James Cleverly, Palmer's friend, who reminded him of a good policeman and a good human being. May merely made a mechanical and emotionless speech, and furthermore, as soon as it became known that MI5 had identified the attacker who provoked the first killings, criticisms of the way the government controlled the suspects of being terrorists, began to happen. The next two attacks, Manchester and London Bridge, brought a similar reaction from the Prime Minister. May prioritized the attack on Islamism, noting that the terrorists came from a deviation from the Muslim religion, and also advocated a diffuse increase in security in Britain. Her presence in Manchester came hours after the attack, and although there was indeed a first effect closing the ranks, the accusations against the Prime Minister for the lack of control of the terrorist threat continued. The attack on the London Bridge was the one that completely broke her story. The Prime Minister became nervous, and when she asked for more security forces, the opposition reminded her of the police cut when she was Minister of the Interior. In the final days of the campaign, May launched into the speech of fear, and crossed a very large symbolic barrier, that of respect for human rights, by stating that, if they stood in their way to defend their country from terrorism, it would violate them. This did not succeed. Undoubtedly, the fire of the Grenfell tower was the biggest failure of the Prime Minister's management, who did not meet the victims on time, and who, later, had to face the citizen's boredom. This case was even worse if we consider that Theresa May did not assumed, as she should, the leadership of the country, and that was a minister, Andrea Leadsom, that respond to the accusations that some citizens made against the Prime Minister. It was the last disaster of a bad management. The polls of weeks before the elections, before the succession of attacks and political and communicative mistakes of the Prime Minister, showed clearly that the conservatives had the wind in their favor to win by an absolute majority the elections. The failure was therefore huge. One of the clearest signs of the magnitude of the tory failure was that the neighborhood of Kensington and Chelsea, the richest in London, elected a Labor MP, defeating the conservative candidate. Theresa May, like Margaret Thatcher, has shown herself since her arrival at number 10 of Downing Street as a tough and impenetrable leader, who does not shake her hand when defending the interests of her country. However, Thatcher applied this way of acting to the maximum, when she sent ships to defend the Malvinas Islands from the invasion of Argentina in 1983, which led to a new electoral victory, in a clear example of a round the flag effect that is launched when a political leader defends his country. May has not reacted like this in any of the crises, and when she has done so, it has been late and bad. One of the main weaknesses of Prime Minister May is her lack of media skills, which caused her not to appear to debate with other candidates  and to be unable to answer journalists in the successive terrorist crises of this campaign beyond mechanical responses and prepared. Therefore, the image of Theresa May is that of a weak leader, without political value, who underestimates the importance of the media, which has varied its position on crucial issues such as Brexit or terrorism, which does not has approached the public in times of tension and, therefore, will last very short time in power. It is a clear example of the round the flag effect, upside down. Theresa May's problem is not only that she has failed completely in political and communicative management, but that she lacks political weight. This, sensu stricto, it does not prevent her from benefiting from an increase in her support if she carries out a good management after a crisis, but it explains why she has not had enough waistline to react correctly since the crisis has manifested itself in its entirety. The closing effect of rows is a double-edged sword, and performances like May's show it. There is another communicative and political theory that should be remembered at this point, especially considering Theresa May's proposal to change human rights laws, if this interfered with the anti-terrorist policies that the tories intended to implement. This is the doctrine of shock, developed by the economist Milton Friedman, and implemented in the dictatorial regimes of Argentina and Chile . According to some experiments in social psychology, Friedman realized that politicians could take advantage of moments of extreme crisis to impose measures on citizens that they would not otherwise admit. In this case, however, the shock was not such, and not even appealing to the speech of fear got her message crashed. The communicative failure of Theresa May is precisely the absence of a clear story. May was working for a year the Brexit’s story, however, she lacked improvisation and ability to react to the emergence of problems. This also denotes flaws in the way to raise the conservative campaign , that used as slogan "A strong and stable leadership", which was, at the end, a dead letter. With the attacks, the tone of the campaign changed. Jeremy Corbyn analyzed the new situation perfectly, and his message varied skillfully, which led to success. On the other hand, Theresa May did not do it. For all the above, it would be amply proven that, had it had a solid political and communicative strategy that would involve her presence in the places where the attacks took place and that would have contributed to the creation of an image of a firm and inflexible leader but also human, Theresa May would have achieved the vast absolute majority she longed for when she called the elections. However, the mistakes cost her dearly. Theresa May is the last example of how political strategy is as important as good communicative management. It should serve as a warning to all leaders. Nobody recovers from an important communicative error, and any politician can commit it, which makes it more dangerous. Therefore, it is more than ever necessary to insist on the importance of a quality crisis communication in which political organizations have prepared actions for any eventuality of this type. Exactly what May and her team have lacked. Institutional communication is one more part - and precisely, not the least important - of political management. If it is about the government management of a crisis, it must not be forgotten that unlike a private company, it is subject to an obligatory control, it must answer before a parliament and before the public opinion. Regarding public opinion, a government has the obligation to connect with it, even emotionally, keeping it informed, directly or, very especially, through its social representatives, and getting, whether or not it is in accordance with government decisions, that the perception be that of conviction in its own acts and that of credibility. For this, it has the advantage of having many more means than a private company and, in principle, being a credible source to whom the media will always pay special attention. The crisis management plan must be confirmed by two large blocks. The first describes the measures to be adopted and the second to be avoided. Collect as much information as possible on the subject of the crisis; responsible for the continuous collection of whatever is published in the media, to make possible the immediate reaction to errors or inaccuracies and to identify, and take advantage of the opportunities that may occur in communication. Prepare specific arguments that allow to protect the key messages that have to be transmitted to society through the media, in order to deal with rumors, inaccuracies or inexactitudes. Also to provide coherence to the appearances of the different spokespersons, thus gaining credibility and avoiding last minute improvisations, which generally have deleterious consequences. Finally, to generate the documentary base of reference for the preparation of press releases and speeches addressed to the various audiences. Activation of the "dark site". This website must be designed in advance and its content is from a statement (written or audiovisual) of the spokesperson or responsible to report what happened, the list of instructions that should be known to those affected and/or their families, a permanently updated explanation of progress in the management of the crisis itself, as all links to official institutions and contact numbers of interest. The line to follow should be that the RRSS do not become the most frequented to obtain information, because it’s more agile when it comes to giving content. Sometimes, this speed does not go hand in hand with the validity of what is communicated. The "dark site" must be in those social networks (Twitter, Facebook, Instagram), with a unique and validated message. Keep the media constantly aware of the crisis’s evolution. For this, it will be necessary, in the first place, to promote the creation of truthful and positive news about the sector affected by the crisis, in order to reinforce in the public opinion the sensation of normality or, at least, control of the situation. Also, ensure the transmission only of what is known accurately and responds to confirmed data. Finally, it will be necessary to call periodic contacts with the media, in order to hold informal meetings in which would be possible to deepen the messages that are issued on a daily basis from the crisis cabinet. These contacts, coordinated by the crisis management team, should also be extended to the different social representatives, if the magnitude or characteristics of the crisis make it convenient. Select and train the institutional spokespersons (politicians and technicians) so that they contribute to support the communication strategy and that they counter the affirmations of other sources -perhaps with little qualification- but that cause the same impact on the citizens. It could be multiple representatives from different levels and even from different geographical areas, but they would have to meet certain characteristics: credibility; discretion; disclosure capacity; availability; synthesis capacity; nerve control; experience in relation to the media; discipline when speaking; absolute identification with the institution and vice versa, and capacity for continuous training on the subject in concern. “Theresa May, una mala imitadora de Thatcher”. El Periódico, June 3, 2017. Available at: http://www.elperiodico.com/es/noticias/opinion/theresa-may-una-mala-imitadora-thatcher-6078764. Date of consultation: July 17, 2017. Article received on 25 September 2017. Accepted on 3 December. Published on 12 December 2017.